With year of industrial experience and knowledge, we are highly involved in offering a huge gamut of White Water Raft-River Rafts for our prestigious customers. These offered products are manufactured using superior quality raw material in compliance with the set industry norms and standards at our advanced manufacturing unit. Rafting Operation is solely dependent on release of water from nearby Dam by Govt. authorities. Water is typically released at 08:15 hrs. There could be a delay in release of water from the Dam. Our clients can avail from us a wide collection of best quality Water Rafting Boat. These products are made from high quality components. 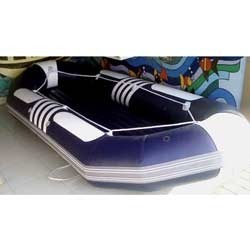 We are leading manufacturers of Raft Boats Fabrics. The Rapids, gushing and unforgiving are a challenge. But there are some who dare to go, who dare to defy the challenge of these unforgiving rivers. Just for the sheer thrill of conquering them. Thrill that’s intense. The thrill of White Water Rafting. Water Slide Raft1) Material: 0.9mm high strength, high density, Rubberised Coated Fabric, or according to customers' prefered material. 2) D=2m or according to customers' sizes.